The disruptions caused by digital marketing tools have taken the business world by storm. But, even as small and medium businesses are embracing digital marketing tools to enhance customer experience, the home improvement services sector continues to fall short. Businesses in the sector have been slow to respond to the changes in the digital landscape and are, more often than not, follow obsolete business processes and operations. Companies and businesses engaged in construction, home services, architectural designing, roofing, and remodelling services are struggling to design a holistic digital marketing strategy that engages customers at every point-of-contact. A possible reason could be the nature of the industry, which requires a high level of trust, interaction, and supervision; which many assume cannot be translated into digital assets. A few companies in the industry have, however, excelled in implementing a holistic and comprehensive digital strategy. Considering that most businesses in this sector do not have many successful case studies and best practices to look up to, I believe it is critical to look at what these companies are doing right. 1. The Company Website: Right off the bat, the website reflects the company’s expertise and experience with a personal touch. The landing page has some great images that include the team and some of the recent projects undertaken. Any potential customer that lands on their website for the first time is likely to instantly understand all their services on offer, their locations, and the business values of the company – so a great job on that front! 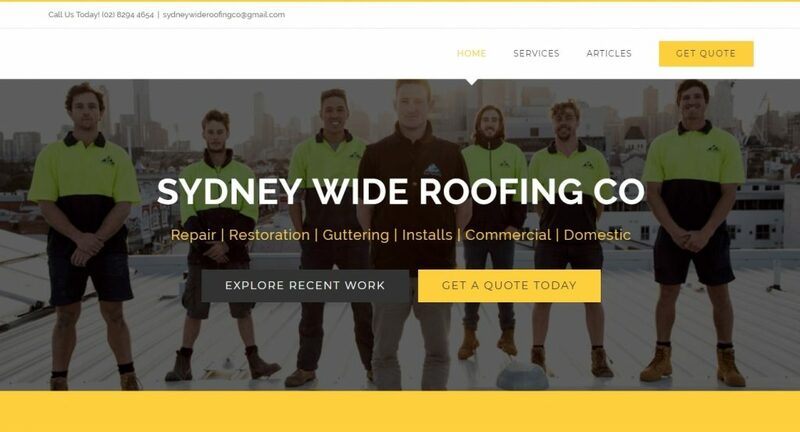 While many businesses in the industry fail to appreciate, or even realise, the importance of an aesthetic and professional website, Sydney Wide Roofing has definitely aced this critical step of the marketing process. The website for Sydney Wide Roofing Company is aesthetic, professional, and evokes trust. 2. Excellent Resources: It’s one thing to be able to engage your customers, existing or potential, but if you are able to give them new information or impart knowledge, you will definitely have an edge. Sydney Wide Roofing recognises the importance of providing relevant and accurate information related to roofing in order to build trust and establish their expertise. Look at it this way, potential customers who look up roofing service providers obviously need some roofing-related jobs done. And when they land on the company’s website, they get access to a resource and knowledge centre that provides additional information and tips on exactly what they are looking for! While I am sure that the conversion rate for the website is healthy, it can be increased even further by collecting contact details of fleeting, confused, and peripheral customers. Not everyone who visits the website might click on the ‘Get Quote’ tab and fill their details as they are not that far down the path towards making decision. In others words, a critical business opportunity is lost when potential customers who are still looking at other businesses, or are simply unsure if Sydney Wide Roofing is a right fit for their requirements, leave the website after going through it. 1. Free Resource Guide: A free brochure consisting of the portfolio of the company and other resources from the blog needs to be made available for free prominently on the website. The prompt to share their email address and get a free brochure should be notably and strategically placed at the home page, blog pages, and the project page. The best part is that the content for the brochure already exists on the website and all that needs to be done is to turn it into a well-designed document! The many useful tips on roofing can be put together as a free downloadable on the website. 2. Newsletters and Weekly Digest on Email: Implementing regular email nurture sequences which relay company news, recent projects completed, and new blog posts are a great way to increase brand recognition in the mind of the customer and position Sydney Wide Roofing as an expert to anyone who is considering getting work done on their roofs. 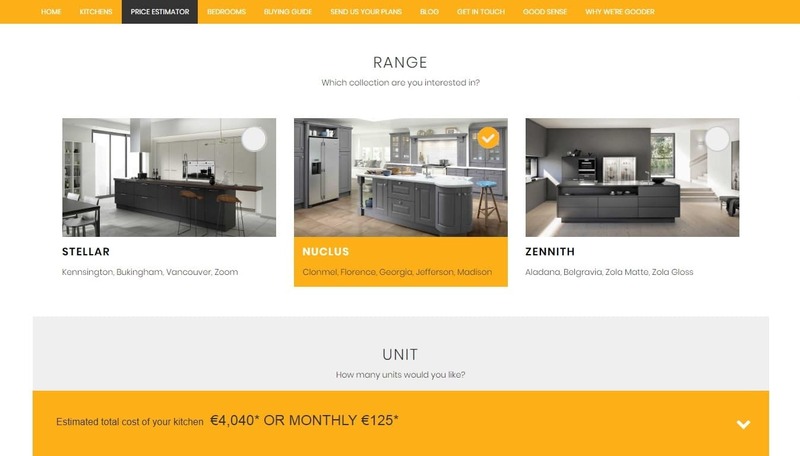 Good Brother Kitchens is a kitchen company in Galway, Ireland and is extremely passionate about delivering an engaging, immersive, and unique experience to all their potential customers. The company promises great products and service at unmatchable prices, and their entire marketing strategy is aimed towards driving this message. The website is really top-notch, and each element on their website has been designed and placed very strategically. Full disclaimer – You should know that Good Brother Kitchens are a Tribecto Automations client, but this is an objective assessment of their strengths and weaknesses that we are working on. The free downloadable brochure is prominently displayed on the Good Brother Kitchens website. Good Brother Kitchens get full marks for their website! The website has a great design and flow, which at a single glance, is able to communicate the right product, offer, and idea. ‘Why We’re Gooder’, a sort of a catchy marketing slogan appears frequently on the website and keeps reminding the customer of the many benefits that the company offers. 1. Price Estimator: There is a ‘Price Estimator’ tool on the website that allows potential customers to get an approximate idea on the amount of expenditure they will incur. The tool is smooth, responsive, and dynamic and works really well. The total cost is also broken down into a monthly payment plan – an ingenious way to be transparent with prospects and gain more trust in the research phase of the customer journey. The Price Estimator tool at Good Brother Kitchens is a great way to engage potential customers. 2. Email Marketing: The company uses ONTRAPORT’s marketing automation tool to engage with prospective customers by sending them relevant blogs and articles. For instance, a customer looking to remodel their kitchen will get updates on recent remodelling projects and portfolio images of some of the related best past projects. These emails all have a link at the bottom of the email so that the reader can book in for a design appointment at any time that suits them and does not leave them feeling pushed into it. 3. 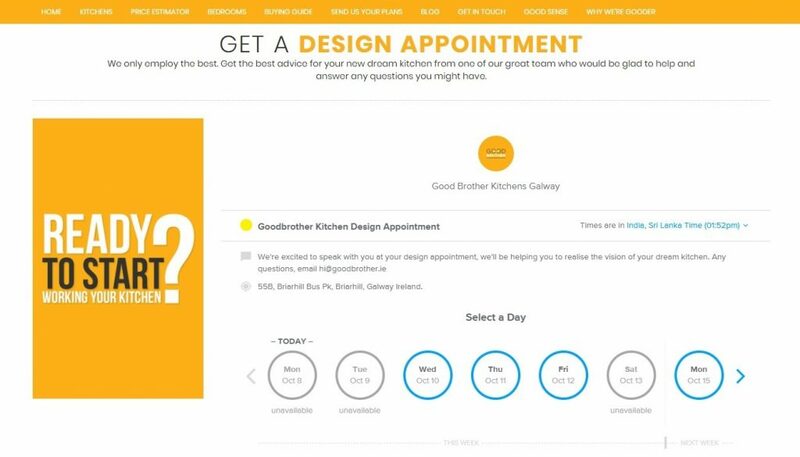 Appointment Booking System: Good Brother Kitchens leave nothing to chance! The website has an easy online appointment booking system which instantly allots you a time slot for a meeting with an expert from the company as per your availability. This is an intelligent way to ensure that customers who are interested get exposed to the company’s expertise, experience, and work in a personal and one-on-one meeting. The online appointment booking system at Good Brother Kitchens leaves nothing to chance! 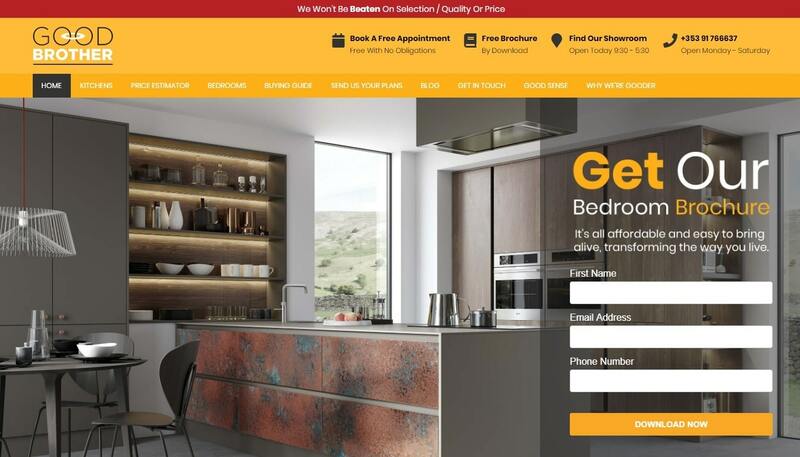 In addition to all the great work that the company is already doing with ONTRAPORT, Good Brother Kitchens can pull its socks up by using a tool like RightMessage and display tailored content to visitors who return on the website. This will enhance the experience of website visitors even further, and display only with relevant information that helps them make their decision. Another great strategy to ensure a high conversion rate is the effective utilization of audio-visual content. Currently, the website lacks any videos, but short and engaging pieces of multimedia content that show the work done by the company can really boost customer confidence and trust. For example, ‘Before and After’ kitchen videos, the transformation of a kitchen in a hyperloop, first-reaction of owners when they look at their remodelled kitchens, or short even video interviews with kitchen owners can be a few ways in which videos can be utilised better. BDS Architecture Limited is a 15-years old architecture firm owned by Tim Foster and has offices in Derby and Nottingham. In addition to offering quality architectural design services for residential, commercial, and a host of other purposes, the firm has been making the most of digital marketing tools and strategies to connect with its customers successfully. The company has intricately designed the user experience of their customers, existing and potential, which is truly remarkable for an enterprise in the industry. 1. Live Chat – Customers have the option of a live chat with company experts and employees regarding any queries or questions they might have. This is a great tool that serves the dual purpose of instantly engaging customers and simultaneously positioning the company as an expert by resolving queries instantly. The live chat on the BDS Architecture website is a great tool to increase conversion rates. 2. 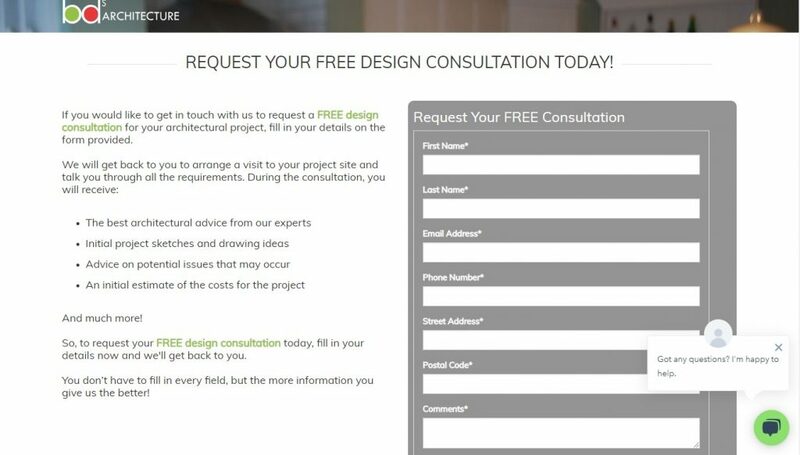 Clear Personalized Offer – The ‘free design consultation’ offer is displayed very clearly on the home page, and the company clearly offers distinguishable content for different types of customers: residential and commercial. Both these are effective strategies to get customer attention and engage them from the moment they land on the website. 3. 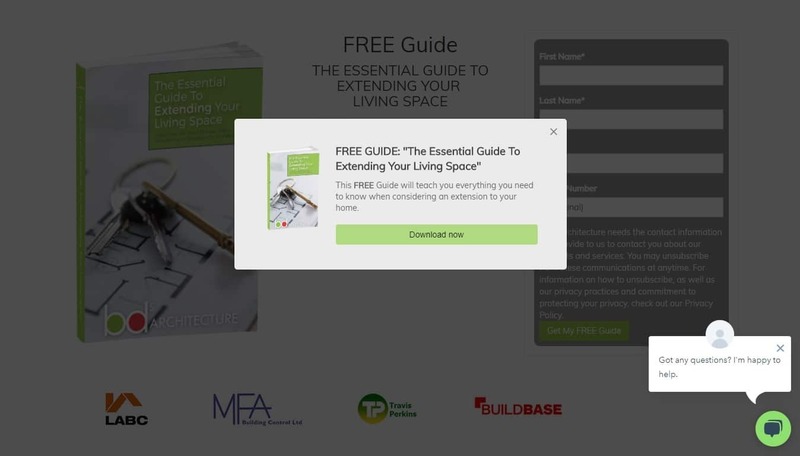 Exit Pops & Valuable Content – When a visitor is about to exit the website, a pop-up offering a free downloadable resource brochure appears. This is a smart way to re-engage customers and draw their attention back. Furthermore, the blog deserves a special mention for two reasons: consistency and creativity. Many times, organizations fail to update their blog pages regularly, or worse, offer information that is not unique. BDS Architecture consistently offers indispensable and value-driven content to its customers and website visitors. The pop-up for the free and downloadable brochure when exiting a website is a great way to re-engage. 4. Powerful CRM – The firm uses Hubspot CRM to manage and track leads that have been generated through its marketing channels. By automating the lead capture and follow-up process, Hubspot has amplified the marketing and promotions done by the company. This not only leads to a high conversion rate but also makes the ROI of marketing strategies measurable. Additionally, Hubspot allows excellent segregation of customers and leads into relevant categories, which further enables relevant and personalized communication. 1. Focus on Expertise and Experience: By highlighting customer stories and their portfolio, BDS Architecture can instantly gain trust from potential customers. Pictures and other multimedia content can be used to demonstrate past project and successes. Bring some of these stories to the homepage and make a better impression with potential customers right off the bat. 2. Simplify CTA: As of yet, visitors have to fill a form in order to get a call back from the experts at the company. A simple online appointment booking system like Calendly can be used to help them fix appointments. This not only elevates the user experience but also puts a stamp of certainty, instead of having customers to wait for someone to contact them. The form can be replaced with a dynamic online booking reservation system to make the experience seamless. 3. Use of Video Elements: Capturing the process of constructing, designing, and remodelling something from the ground-up on video can effectively drive the company’s message across. Even other videos that explain basic architectural processes or inform users about permits and certificates can be used to add value to those in the research phase of the customer journey. The terms ‘digital marketing’ and ‘marketing automation’ might seem daunting to small business owners in this industry, but it is time to embrace their benefits. Businesses in the home improvement sector have immense potential to personalise their messaging and communication to potential customers and make their marketing strategies more effective. Intelligent marketing and business automation tools, like ONTRAPORT, are powerful enablers for small businesses to get started with digital marketing automation. Marketing automation tools can help home improvement businesses build trust and loyalty among customers, which is a critical element for success in the industry. By fusing your company’s experience and expertise with modern communication strategies, you will be able to drive business growth and interact with customers successfully. And here’s a bit of a secret: you can’t escape it! Sooner or later, you are going to have to use digital tools to run your business. In fact, if you’re not, you’re already losing your business edge to every company that is using such tools. A majority of the businesses that exist the way they do today are not expected to remain relevant in the future. That means the time to prepare for a more digital, connected, and automated world is NOW. The question is, are you ready?